Young Muslims – A Growing Danger to Western Society? In recent comments to two articles I wrote previously on Breaking Spells, the28 wrote that Islam-Watch.org is a site that cannot be used as a reference since the authors at that site (there are many) do not “really know Islam trully is (sic).” My response was, of course, to point out that the authors at Islam-Watch.org are former Muslims who are very well informed about Islam and are in the best position to actually criticize the cults of Islam because of their insights. Indeed, it would be fallacious to argue that the site should be disregarded since the commenter hasn’t demonstrated their lack of knowledge -in fact, it is very easy to see that the authors are very knowledgeable about the topic simply by reading their works, which stand on their own merits. But the28 also implied that the media (assuming he means news outlets, newspapers, blogs, etc.) are biased to believe that all Muslims are like Iran in their beliefs. I don’t think this is the case. Indeed, I don’t get that feeling from the media either. If anything, Muslim superstitions are down-played in media reports (except, perhaps, ultra-conservative and Christian sources -particularly blogs) and the focus is on alleged extremists and hard-liners. I think the media has intentionally ignored the irrational and dangerous nature of a large number of Muslims living in western nations. To support this contention, I cite the following report: Living Apart Together: British Muslims and the Paradox of Multiculturalism (Mirza, Senthilkumaran, and Ja’far 2007). The report was written based on survey data compiled by the authors and separated into various age-groups. Their intent was to explore the attitudes and beliefs of Muslims living in Britain. In general, they found that the majority of British-Muslims desire integration and acceptance and do not seek to dominate British culture -just maintain their own. This is consistent with the criticisms that the28 gave me in another comment on the same day, which was to refute the claim that I asserted that the Muslim religion seeks to dominate the world. Yet I still stand by that claim. And you’ll see why. While many of the Muslims polled were moderate and answered questions rationally, there were some surprising figures among 16-24 year olds. 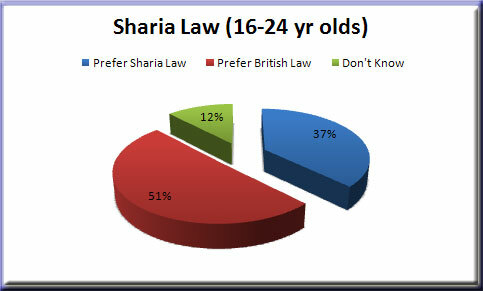 For instance, the question was posed, “would you prefer to live under Sharia law or British law?” Most British-Muslims chose the latter (59%), but when you segregate the age groups, 16-24 year olds were more in-favor of Sharia law than any other single group at whopping 37%! And this trend is consistent with nearly every question asked, making younger Muslims in Britain more hard-line than older Muslims. The number of Muslims living in Britain is thought to be at least 1.5 million and possibly as high as 2 million. What that implies, assuming that the survey is a representative sample of British Muslims, is that 500,000 or more Muslims in Britain prefer Sharia law to British. But what does Sharia Law entail? Among the most commonly identified “laws” in this theocratic form of governance are the wearing of veils for women and the prohibition of apostasy. So how do Muslims in the 16-24 year old age group to these issues in Britain? 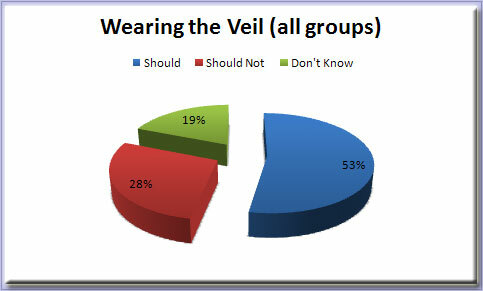 A full 53% of all Muslims in all age-groups surveyed believe women should wear the veil. That’s more than half. But this is a cultural issue, right? Fair enough. What about apostasy (leaving your religious faith for another, or no other, religion)? 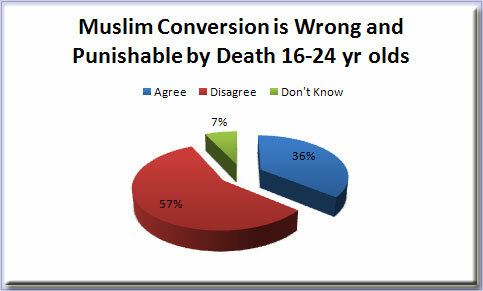 36% of Muslims between the ages of 16-24 believe that conversion to another faith, abandoning your faith, or the act of converting a Muslim from Islam is wrong and punishable by death! That could be a figure as high as 450,000 Muslims living in Britain -assuming there aren’t actually 2 million rather than 1.5 million. Admittedly, I don’t have the precise number of the total population of Muslims in the 16-24 age group, so I’m relying on the total responses in the survey that were in agreement, which was 31%. The point of the hard-line younger generation isn’t lost in this concession. Clearly, resentment of western culture and hard-line mentality is on the rise among the younger generation of Muslims in Britain and probably the West in general. This generation is likely having a noticeable influence on their elders, encouraging a revival of Islamic fundamentalism. Islam is an evangelical religion, whether those that pretend to call themselves “moderate Muslims” care to admit it or not. Otherwise, Islamic cults would not have spread so efficiently from the Near East to the other continents and regions of the world, particularly Africa and Indonesia and, now, Europe and North America. The Muslim populations that are there wish to remain segregated and under their own laws, independent of local governments. They want to allow conversion into their own religion but not out of. They want Muslims to marry only Muslims and, in extreme cases, use terrorism and violence to prevent otherwise. I’ll agree that not all or even most Muslims in western communities act or believe in such a way. However, there are, apparently, enough Muslims, deluded by their superstitions, who live in Western communities that rational thinkers need be aware and cognizant of the danger that lurks within. Mirza, Munira; Senthilkumaran, A.; Ja’far, Z. (2007) Living Apart Together: British Muslims and the Paradox of Multiculturalism. London: The Policy Exchange. This entry was posted in islam and tagged apostasy, apostate, islam, muslim, religion. Bookmark the permalink. Wow, it’s first time in my life my comment is added on posting, i have to be happy or sad? I have new comment on last post, i hope you already see it. Since the commenter hasnâ€™t demonstrated their lack of knowledge -in fact, it is very easy to see that the authors are very knowledgeable about the topic simply by reading their works…—> but why i don’t really get with what he say? are my Islam is different kind with his? or he just exaggrating it and added with local custom? Sharia Law —> yes it looks violent, but yet really effective to make people not doing bad things. The burglar will think thousand time before stealing, because he bet his hand. To consider: Every mosque or Islam group doesn’t have structural organization that uniting all Islam in the world (not like the church), they walk independently, but yet have same guide(Al-Qur’an and Hadist). How can Islam dominate the world without united by global organization? Now survey American Christians and ask them how many consider Islam an evil religion. Ask Christians how many believe that Muslims want to take over the world through violence. Then publish those results. Thanks to the hate propaganda, of which this blog is a part, the percentages are quite high. Religion is not bad. What is bad is people that twist and spin the teaching of their religions to fester hate against others. Take a tour through history and see how much killing has been done in the name of Christianity. The true purpose of religion is to bring people together, not to drive wedges between them. Mohammad believed in the teaching of Jesus. Now survey American Christians and ask them how many consider Islam an evil religion. Ask Christians how many believe that Muslims want to take over the world through violence.—> If you aware, it just like an old story when Japanese people were consider being a bad guy, every American afraid and hate all things that related to Japan, but now many American loves it (anime, song, movies, etc). Same goes to Germany, Uni Soviet, until now Islam. Maybe some time Islam also will be loved, just when the “role” is changing (again). Take a tour through history and see how much killing has been done in the name of Christianity.—> I agree too, and when i learning and studying about it, the true is not religion that makes the war, the religion just being used as “shield” by some group (personal) importance. The true purpose of religion is to bring people together, not to drive wedges between them. —> I agree, same like before it just being used by some greedy people than in their mind only money, money & more money, whatever it goes. Mohammad believed in the teaching of Jesus.—> I agree (four times in a row ;)) because Jesus or Isa are have same position as a prophet, and no Muslim are not believe in Jesus, just Muslim not consider Jesus as God (or one of it), but normal human like us. Yea, it’s just the “Shield”.. That seems to be used OVER, AND OVER, AND OVER AGAIN. Wow! The only question is whether they were affirming what they thought the Koran said (i.e. The Koran says…), or if they actually were in favor of such a punishment being enforced. Do you have the wording for the questions? “Islam is an evangelical religion…” what!? Islam will never match Christianity’s past of world acceptance by imperialism, forced conversation, war, and yes evangelism. So it seems that this study goes to great lengths to show that a small fringe of islam holds extremely conservative/radical ideas and admires terrorists. This seems true to most monotheistic religions. However, the fact remains that none of the 3 monotheistic religions (christianity, islam, judaism) pose an existential threat to the other. Frankly, this blog post seems to be little more than another repeat of the “Islam is coming to kill us” message that is being steadily broadcast by christian extremists as an excuse to meddle in middle eastern affairs. I’d say every extremist is a danger to society. Not only muslims but christians and members of Scientology. So what’s new about your crap? I think some are missing what I was pointing out with regard to the study I cited: many (indeed, most) Muslims polled and surveyed had rational and moderate answers. The extremist answers were in the minority. But the actual point I was trying to make is that, while the extremists are in a minority, this minority is a significant number and primarily found in the younger generation. Finally, to the accusation that this blog is “little more than a repeat” of the Christian message so “steadily broadcast,” I’d say you probably didn’t bother to read any other posts outside of this or the ones I linked that were related. You might take a look if you think that. In fact, after looking at your own blog, I find it fascinating beyond belief that you dare criticize the message of other blogs! I just read that only 3% of Pakistanis believe that al Queda carried out the 9-11 attacks. If this is true of other Muslims, then wouldn’t that make al Quada look like a victim/martyr in the Muslim world? Heck, If I believed that al Quada WAS NOT involved in 9-11, and was really just framed, I might also agree with the statement “I admire organizations like Al-Qaeda that ARE PREPARED to fight against the west.” I bring this up to show that pre-suppositions behind such surveys can impact the results.